It’s December, and the holiday season has officially started. There are so many wonderful winter activities to get you in the holiday spirit, but we narrowed it down to ten activities that will surely prepare you for all things winter. 1. Snow Days at Legoland: Snow is not a typical occurrence here in Carlsbad, but Legoland’s Snow Days (with fresh snow made all throughout the day) allow locals and visitors to experience the perks of snow while still staying close to the beach. This winter event includes sledding, snowball fights, snowmen building and ice skating. 2. 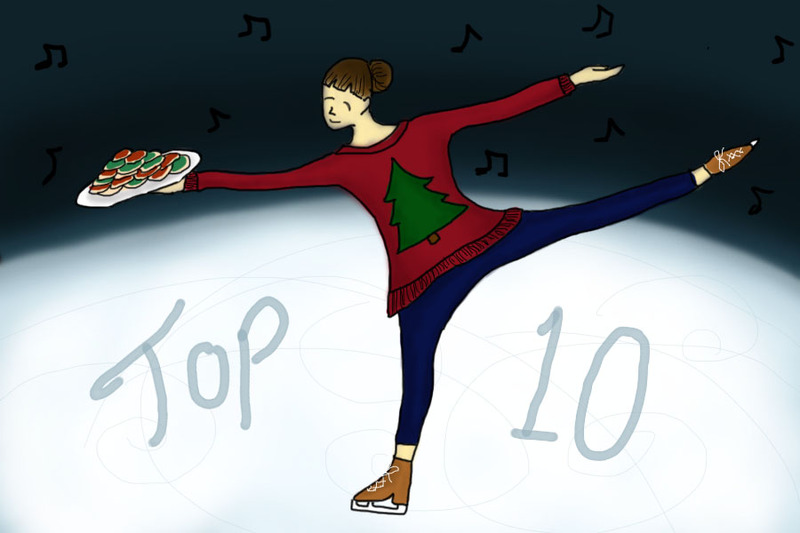 Ice skating: Whether you hover along the wall or skate between groups of children at top speeds, ice skating is a great way to get excited for the holidays. Due to the noticeable lack of snow in Carlsbad, ice skating rinks (such as Ice-plex, UTC and Legoland) provide the icy environment. 3. Making hot chocolate and movie nights: When you are done ice skating, relax with a cup of cocoa and a marathon of movies such as Elf, It’s a Wonderful Life and How the Grinch Stole Christmas with friends. 4. ABC Family’s 25 Days of Christmas: All Christmas movies are easily accessible if you tune into ABC Family. This annual event heightens the Christmas spirit with movies like Rudolph And Frosty’s Christmas In July and Home Alone. The countdown to Christmas continues with the daily movies and shows. 5. Tree lighting and festive lights: Take a drive to find the houses with the best and brightest Christmas lights — or possibly see houses that haven’t taken down Halloween decorations yet. Or even visit Christmas Card Lane in San Diego for a display of giant plywood Christmas cards and lights. 6. Ugly Christmas sweaters: Gather all your friends in their tackiest Christmas apparel and have a holiday dinner or a white elephant gift exchange. 7. Visit Santa: Take a trip to visit St. Nick and truly experience this holiday season. He will be at the Carlsbad Premium Outlets through Dec. 24 for photo opportunities. 8. Dinner with family: The Holiday season would not be complete without traditional Christmas meals. Cook up some ham, turkey, potatoes, rolls and green beans to fill your stomach with happiness this season. 9. Baking holiday cookies: Fill your home with the warm aroma of fresh chocolate chip or gingerbread cookies and get into the holiday spirit. Host a cookie exchange with your friends and try each of their holiday culinary masterpieces. 10. Holiday music: Walk into any department store and your ears are filled with the wonderful sound of holiday music. At first, you resist it–but you can’t. Before you know it, Jingle Bell Rock is stuck in your head for three days straight. But it is December, and we couldn’t have it any other way. Kyxy 96.5 FM Radio station also has had you covered with 24/7 Holiday music since Thanksgiving day. Happy holidays from the Lancer Link!